You’ve already celebrated National Soft Pretzel Month in April —and it was delicious. But let’s not forget October — when we pay tribute to our twisty snack friend during National Pretzel Month. Soft, crunchy, looped, straight, or as a bread, pretzels have captured the imagination of the Western world and have a long history and large influence. So snack away and enjoy the essence of pretzel! There was once a Philadelphia museum dedicated entirely to pretzels. The Reading Pretzel Machinery Company in Pennsylvania introduced the first automated pretzel maker, which made 245 pretzels-per-minute instead of the 40-per-minute an individual worker could make by hand. Julius Sturgis opened America’s first commercial pretzel bakery in the town of Lititz in Lancaster County, Pennsylvania. 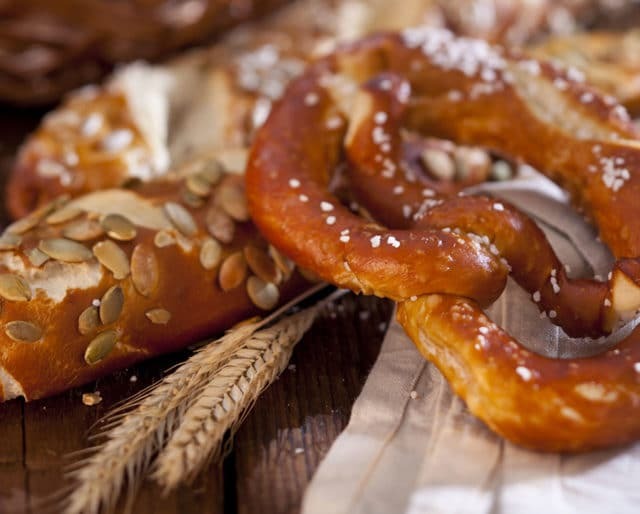 German immigrants brought pretzels with them when they began settling in Pennsylvania. Monks baking pretzels in the basement of a monastery in Vienna, Austria overheard invading Ottoman Turks trying to build tunnels under the city walls. The monks alerted the rest of the city, helping to defeat the attack. Go to your local bakery for chewy ones, or your local grocer for the hard sticks. Or you can order artisanal soft pretzels from a place like Sigmunds in New York, topped with everything from truffle oil to herbs and seeds. Here's where you can get creative. How about a cheese-stuffed pizza pretzel? Or a s'mores pretzel? Or a spinach, artichoke and bacon pretzel? The recipes are out there — and don't forget the accompanying dipping sauce. Try subbing in homemade soft pretzels for bread during a dinner party. Or get your gang together for a potluck pretzel-and-beer party and have a best-made pretzel contest. Where there are pretzels, twisty good times aren't far off. The pretzel has been used as an emblem of bakers in southern Germany since at least the 12th century. Pennsylvania is the American pretzel-making capital, producing 80% of U.S.-made pretzels. The average American eats about one-and-a-half pounds of pretzels every year, and the US pretzel industry is worth over $550 million annually. The world's oldest pretzel fragments — unearthed during an excavation in Regensburg near the Danube River — date back over 200 years. It's believed that Mississippi's Andrew Dunn holds the world's record for number of pretzel sticks held in the mouth, with a total of 110. They have religious significance among Catholics. Plus, their lineage runs through the settling of Swiss German immigrants in Pennsylvania. Large soft pretzels with all kinds of sweet or savory toppings/fillings. Small pretzels coated with everything from chocolate to yogurt. Pretzel sticks ready to dip. And don’t forget peanut butter-filled pretzel bites! Pretzels are one of the most adaptable snacks out there. Whether it’s the city of Freeport, Illinois calling itself “Pretzel City USA,” or the city of Philadelphia renaming a facility “Pretzel Park,” it’s obvious that this crunchy/chewy snack food has a popularity that's truly, twistedly singular.